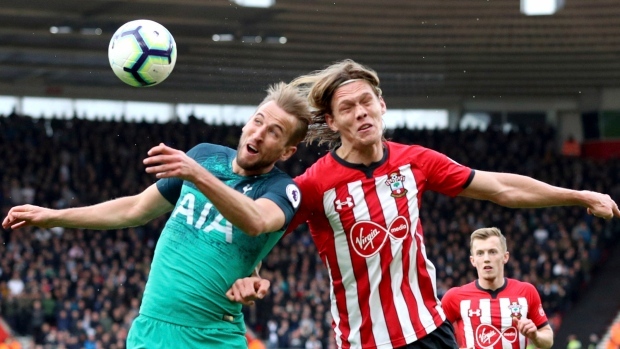 SOUTHAMPTON, England — Southampton scored twice in five second-half minutes to stun Tottenham 2-1 on Saturday, boosting its hopes of avoiding relegation from the English Premier League and loosening the visitors' grip on a top-four position. It was a crucial comeback from Ralph Hasenhuttl's team, which stayed two points clear of the relegation zone. For Spurs, it was a head-scratching loss given the way they dominated the first half. The London club was in the title race two weeks ago but faces a tough fight for the Champions League places after three losses and a draw in the last four league games. With Mauricio Pochettino watching from the stands following a touchline ban, Tottenham took immediate control and hit the woodwork twice in the space of two minutes before Kane provided the breakthrough in the 26th. Kane found his England teammate Dele Alli, then peeled off to the backpost where he got the ball back before firing in a low finish. Spurs had chances to extend their lead as Alli squandered a great chance on the break while Christian Eriksen stung Angus Gunn's palms with a rasping drive from distance. Kane nearly added a second after the break after he squeezed through two defenders before seeing a curling effort tipped around the post by Angus Gunn. The England striker then missed a great chance in the 68th after collecting a reverse pass from Eriksen, as he scooped the ball over the top. And that proved costly as Southampton levelled in the 76th when Stuart Armstrong got in down the left and rolled in a cross which Danny Rose inexplicably let through his legs, allowing Valery to finish at the far post. Five minutes later the turnaround was complete as Ward-Prowse curled a delightful free kick over the wall and into the corner.